Welcome to my home-cooked journal. Here you will find my rants about every day life and things that keep me busy. In the past I have frequently written, but there's no saying if I'll continue on that path. It all depends on how busy I am. Have fun reading my scribbles. A future for De WAR? No surgery, but disaster strikes nevertheless! Mamma Mia the musical - what fun! De WAR is a place in Amersfoort where people can develop their ideas and create inspiring and innovating things. The Fablab is also part of De WAR. It is a place where you can use nifty tools like a laser cuttor or a 3D printer to create things and it runs without government funding! Some of the props of Evolution Events' events have been made with the help of the machines in the Fablab. Why this post? Well.... the municipality of Amersfoort has decided to sell the ground that De WAR is using to another bidder who wants to build student houses on it. We do not have enough student housing in Amersfoort, but we do have some. We do not, however, have another place like De WAR. So we will gain a bit but loose a lot. It is not too late yet! De WAR is taking action. Please help in keeping De WAR a creative and free environment in Amersfoort. See what you can do and read more background on the website, share the messages from the Facebook page (#toekomstindewar) and sign this petition. I proudly present my By Brenda portfolio website! It has taken me quite some time and two tries to make something that looks somewhat like I had in mind (though I had to make some concessions) and that still works well on small devices like phones and tablets. I did three courses about responsive web-development and responsive images and tried my best to make this mobile friendly. I learned quite a lot but also experienced a lot of the know frustrations of my first job, though I must say that there has been much improvement in the world of the web. If you find any mistakes on the site of any kind (spelling, errors, malfunction) please let me know and tell me what kind of device you were using. Mind you: I tried to keep the images as low in file size as possible but to get clean images you do need some quality (thus bigger file size) so loading the detail images of a portfolio item might take some time especially when you're on a slow connection. However: you load these on demand (after clicking an icon) and not at first page load. I notice the days are getting shorter (no!) but the weather is still mostly good and now that we have a swing-couch in the back yard I will need to spend some time on the thing to finally finish the shawl/wrap that I am making with this pattern. It was originally started because I like the pattern, but now it has become something for my Orenda character Crissy. I've also worked on it in character. So, what have I been up to since my last blog post? Well... on the first of July I could have gotten surgery for my hernia but I cancelled that. Then in the evening there would have been a little festival in Veenendaal on which Amersical would perform a couple of Mamma Mia songs. Alas, the weather sucked and it was cancelled. Retry on the 26th of August (and the weather looks to be boiling hot that day... omg.. I'll be wearing spandex....). On the third of July there was an Orenda special; a picknick in a beautiful park. Both soggy (started with pouring rain) and sunny and quite thrilling. It left me aching for more. Fortunately we did not need to wait too long because 12-14 August the main event was held. More about that later. So the rest of July was spent making a corset. Learned a lot, not completely pleased with the final result. In the end it became a "this will have to do" and there are some flaws that I can not ignore. However, it stayed up great and I got positive reactions to it. So I'll probably wear it again while working on a new corset with a self-made pattern. I also spend a lot of time finishing the wedding costume that was commissioned to me and a prop for Orenda. My back was behaving well until one day I woke up with pain again. That lasted for two days (but was bearable) and then things went well again. So I'm still a bit in doubt if I am fully recovered yet. So now I am planning on yet another costume upgrade. This time the skirt. I want to make a new mock-up (honestly, mock-up!) corset with a pattern that I will draft myself to prepare for the wedding dress (though we're postponing the wedding since we have so much fun in the time leading up to it). I want new covers for my other IC shoes (which will match the new skirt better than my current shoes) and I'm writing more IC letters and trying to come up with some more interesting/conflict generating background for my character. There'll be some IC chats as well, perhaps a special. But the main event will take a year (nooooo!) of waiting. However, this buzz should die down sometime... I'll just need to concentrate on the next fun thing: balfolk on September 11th in Wageningen. I'm still learning German via Duolingo, doing some online Udacity courses on responsive webdesign (trying to figure out if I want to work in that field or not), planning to start home-training for belly dance again and in September Amersical and streetdance will start again too. Enough to keep me distracted. Oh... and of course I'll need to start looking for a job again in earnest, though I am still unsure what to do. I'll have a talk about that with UWV at the end of this month. Well, as the title states I have decided not to have surgery on my hernia. The reason is that I was afraid of the treatment and the long looooong period of revalidation. Besides that the pain was manageable. There's some pain in my hip every now and again and on bad days also on the outside of my right calf but is not as bad as I thought it would be without the medicines. And I can surely say that I have kicked off of those meds now, so this is all the pain that there is left. Then how did disaster strike? Well, because I had expected our vocal coach to be wearing my outfit for the extra performance on the first of July I laundered it (by hand). Yesterday I noticed some 'water stains' and decided to wash and thouroughly rinse it all again. But, the horror, the stains only got worse and some of the blue dissolved and left silver behind! So now my top is ruined! Fortunately I did not wash the pants because there was less armpit sweat and make-up involved there. So that one is still good. 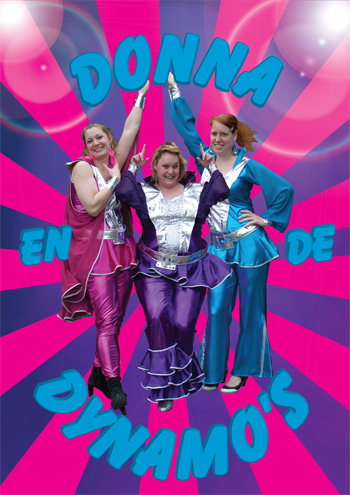 Last weekend Amersical performed "Mamma Mia, the musical" in a theater in Amersfoort. It was great, despite some health issues of several people, including myself. I caught a cold on Wednesday and over the weekend slowly lost my voice. Crappy timing!! So on Saturday afternoon things were still quite well, on Saturday evening I could not do my long note in one of my solos and on Sunday I even had to playback some songs! So frustrating! Fortunately my singing coach offered some advice and the rest of the group sang along with me so that my sound feed could be turned off or louder depending on what my voice did. The audience for the matinee performances was (as always) a bit timid, but the Saturday evening was (as always) great. We even got applauded for just walking onto the stage in our glitter outfits! We got lots of compliments. I even got compliments via other players from 'their' audience! There was quite some stress in changing costumes and physical discomforts, but it is always such a rush to perform together.